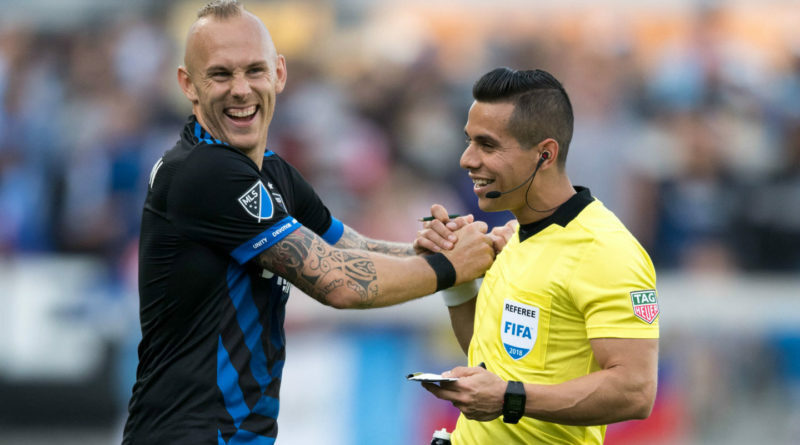 Having welcomed his first child to the family almost 18 months ago, life shows no signs of slowing up for PRO official Armando Villarreal, and having reached his 100th MLS appearance as a center referee at the age of 32, he’s been in the fast lane for some time now. His debut came back in 2012 in a fixture between New York Red Bulls and Chivas USA. It was a far cry from his first experience of refereeing at the age of 18, when he was taking charge of five-year-olds as a high school senior, but those alongside him in the crew that day had been there and done it all before. “I was a fourth official at the beginning and seeing the experienced referees during that time really helped,” Villarreal explained. “I was able to see them working and hear them on the radios, how they communicate with players and their styles, because everyone is different. It really helped to gain that experience. “Then it was my time to do my first center, and I was lucky enough to have experienced officials with me. My fourth official was Mark Geiger, AR1 was Joe Fletcher and AR2 was Greg Barkey, so I was well taken care of. I really appreciated that assignment. With the job, though, comes plenty of challenges – not to mention balancing professional life with starting a young family. His thanks go out to his PRO colleagues, his friends and family, but namely his wife. Villarreal has become accustomed to the long trips away from his home in San Antonio, Texas, often fulfilling assignments up in New York, Toronto or Seattle. Add PRO camps into the mix, and sometimes the homeward journey can’t come soon enough. “You don’t dream of getting 100 games. After you do your first you’re just hoping you get your second, but to get here I owe it to my friends, my family and my mentors. They inspire me to do what I love. “Before the baby I would get home and my wife was always good. After getting back to the hotel, packing and then travelling the next day, you may have only slept three or four hours, so she would always tell me to go take a nap which I was always grateful for. With parenthood comes the inevitable early mornings, but his 17-month-old baby isn’t the only thing that gets him out of bed. The 2018 FIFA World Cup is currently taking place in Russia, with Moscow eight hours ahead of his home city, but he doesn’t let that get in the way of his passion for refereeing. Jair Marrufo was taking charge of Belgium against Tunisia on the same day Villarreal was in Seattle, ready to officiate Sounders’ meeting with Chicago Fire – even a 5am kick-off wouldn’t stop him watching it. After all, it’s where Villarreal wants to be. In 2015, he was appointed to the FIFA Panel of international referees, and seeing two PRO officials taking charge of matches in Russia is more than the inspiration he needed. “Before having a FIFA badge, that’s all you want. You don’t dream of being at a World Cup, or the Olympics, until you have that. When I got it, I knew my I was getting closer to where I wanted to be because I know I’m eligible for those competitions now, although it’s not easy. “I woke up at 4:45am in Seattle to watch Jair’s game. It’s an inspiration to see our boys on the big stage. When Mark and his crew came out for their first game [Portugal against Morocco], everyone had a game face – everyone except Joe [Fletcher]. Joe was smiling and that gave me goosebumps.